Came across this recipe and thought I’d give it a try. Instead of making it on the stove, I chose to make it in my Crock Pot. It was super simple to make, especially when all you need to do, is throw almost everything in and let it do it’s thing. I let the frozen chicken breasts cook in the salsa verde itself first for about 5hrs. Then, I shredded the chicken and placed it back into the pot. 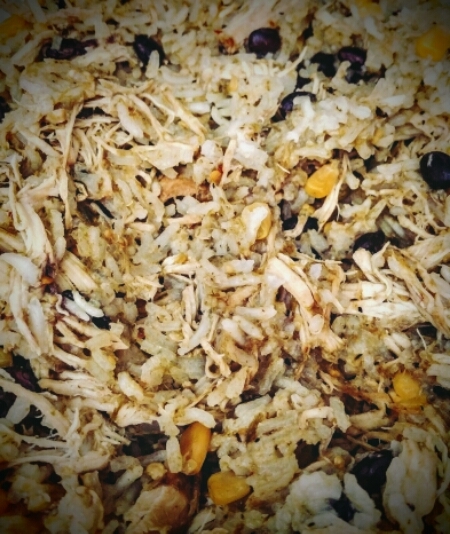 I also added uncooked rice, 2 cups of water, black beans and corn to the pot as well – to cook for almost 2hrs. When I went to check on it later, I saw that it was ready before the timer went off!! I do like the flavour a lot, but will say the La Costena sauce I used is VERY spicy…woo wee!! So if you can’t handle spice like that, find a milder sauce. Will definitely make this again, but will try a different sauce next time.